5 Ways to create beautiful bathroom lighting - Expert guide. At Doug Cleghorn Bathrooms, our adept team of designers are always mindful of the importance of well-thought-out bathroom lighting. Playing a key part in the interior design scheme of any room, successful bathroom lighting is all about mixing layers perfectly. Also able to take a room from drab to fab in an instant, don’t be afraid of mixing lighting styles when it comes to your bathroom revamp. From elegant pendants to atmospheric mood lights, here are 5 clever ways to create beautiful bathroom lighting. Dramatic yet subtle, concealed bathroom lighting will add the wow factor and work wonders for the interior of your bathroom. With concealed lighting, you can’t actually see the power source, however, you can still see the light it emits. Use hidden lighting to highlight architectural features or behind a mirror to provide a glowing focal point. 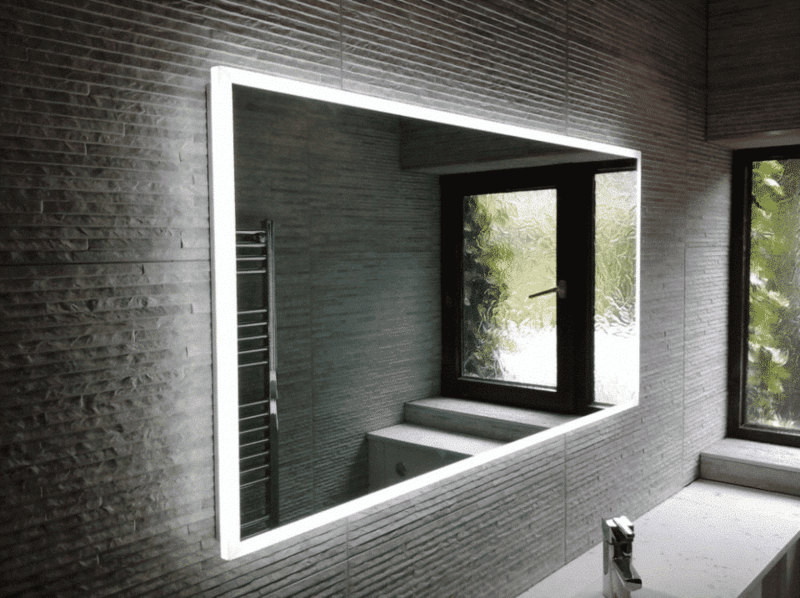 Concealed lighting is also an effective way of creating different levels of interest in your new bathroom. Colour changing mood lighting can be as subtle or as striking as you’d like and is a clever way to add ambience and set the tone in your bathroom. If you’re lucky enough to have quite a large bathroom, you could even create zones with partition walls and use different coloured mood lights within each. Try bright white LEDs for a revitalising shower area or moody blue for a tranquil bathing suite. LED’s have come a long way since they were first introduced in the 1960’s. No longer seen as the dimly lit alternative to the halogen, nowadays consumers are spoiled for choice when it comes to energy efficient bathroom lighting. As well as saving you money in the long run compared to conventional bulbs, modern LED downlights also work beautifully when paired with a traditional pendant light. Why not go all-out, with a glamorous and ornamental chandelier? Keep the decorative lighting quite dim and let the modern spotlights do the work for a bathroom look that is on another level. You can’t knock a bit of natural daylight and the bathroom is no exception. As well as being a positive mood booster, natural light also brings with it a heap of health benefits too. Decorative textured glass removes the need for a blind or curtains whilst still maintaining a degree of privacy. Alternatively, a solar tube that channel’s light through the roof or a Velux skylight are both clever ways to maximise the natural light in your new bathroom. An illuminated vanity area, including the mirrors, is a great way of adding another layer of lighting to your new bathroom. The additional lighting will also create warming accents, especially when used underneath stylish cabinets and drawers. At Doug Cleghorn Bathrooms, we have a great line of illuminated bathroom furniture, including the HIB Xenon illuminated wall cabinet range, so you can enjoy that deluxe hotel-like feel but in the comfort of your home. Thank you for taking the time to read our latest blog post. Our customers are at the centre of everything we do and nothing makes us happier than seeing their faces light up during a new bathroom reveal. Pardon the pun. All of the lighting products mentioned in this post can, by all means, be integrated into your renovation, with our design team offering expert help and advice, to ensure yours is a beautiful, well-lit bathroom. We are devoted to actualising your dream bathroom and so we would absolutely love to discuss your specific and unique requirements. It’s also important to explore ideas with like-minded people and so we always keep a fresh supply of tea or coffee on the go at our East Leeds Showroom. For bathroom lighting inspiration in abundance, we would welcome you to visit us at Doug Cleghorn Bathrooms, Leeds.